Enersys Hawker Cyclon X Battery 2V 5.0Ah 0800-0004 from County Battery Services. Enersys Hawker Cyclon X Battery 2V 5.0Ah 0800-0004 is a maintenance-free lead-acid rechargeable battery. 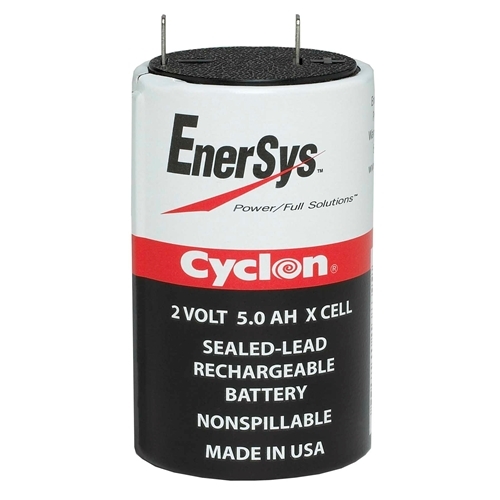 The 0800-0004 from Enersys is a CYCLON single cell battery with quick connect terminals. Enersys Hawker Cyclon X Battery 2V 5.0Ah 0800-0004 provides high stable voltage delivery, metal outer case & spiral body construction, single cells emit minimal or no gassing under normal charging conditions hence they are safe for installation in offices, aircraft cabins, hospitals and places occupied by human beings. Suitable for applications like Power Management, Portable Devices, Consumer Electronics, Industrial.